Community leaders, campaign coordinators and Foodbank supporters came together to celebrate the success of the 2018 Harvest for Hunger Campaign during its celebration event held at the Akron-Canton Regional Foodbank on May 18, 2018. This year’s Campaign was another record-breaking year and will help provide more meals than ever before to community members struggling with hunger, explained Campaign Co-Chair Dr. Brian Harte, president of Cleveland Clinic Akron General. “I had only been in Akron 20 months before I became a part of this campaign, and it’s been a fantastic experience leading such a critical event for our community,” said Harte. Harte announced this year’s campaign results to more than 120 guests in attendance. With support from the community, the Campaign raised enough food and funds to provide more than 5.3 million meals to its network of hunger-relief partners, surpassing its goal of 5.2 million meals. With more than 200 organizations, schools, churches, social groups and businesses organizing food & funds drives, the Foodbank saw a significant increase in the number of pounds of food collected throughout the Campaign. A large food contributor to this year’s efforts was Ball Corporation, donating more than 303,000 pounds of food. The Campaign’s top financial donors were FirstEnergy Corporation, Shearer’s Snacks and The Goodyear Tire and Rubber Company. Top food contributors were Ball Corporation and the National Association of Letter Carriers. Other organizations recognized at the celebration were Lake Center Christian School as the Young Harvester of the Year award winner, Dunkin’ Donuts for their Breakout Performance, Ball Corporation as the Innovator of the Year award winner, Alliance Data as the Rookie of the Year, and FirstEnergy Corporation as the Steadfast Supporter of the Year award winner. Kim Anderson, from the Akron Beacon Journal/Ohio.com, received the Coordinator of the Year award. 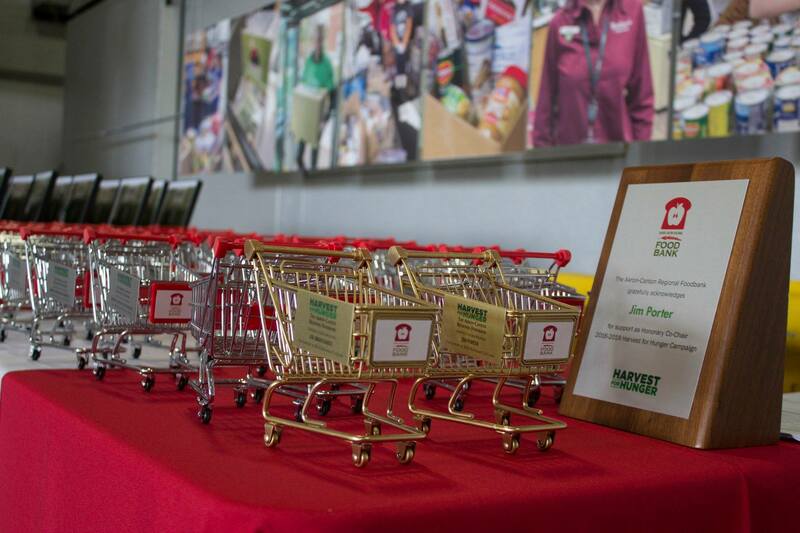 Other contributors recognized were the Foodbank’s many supermarket partners and media partners, including Buehler’s Fresh Foods, Dave’s Supermarkets, Fishers Foods, Giant Eagle, Heinen’s Fine Foods, Akron Beacon Journal/Ohio.com and GateHouse Media Ohio. The Harvest for Hunger Campaign is a joint effort of the Akron-Canton Regional Foodbank, Greater Cleveland Foodbank, Second Harvest Food Bank of the Mahoning Valley and Second Harvest Food Bank of North Central Ohio. This annual awareness campaign focuses on fighting hunger across 21 counties in Northeast Ohio. For more information about donating to support hunger-relief efforts, like Harvest for Hunger, please visit akroncantonfoodbank.org or call 330.535.6900.